Our church and crypt halls are available for hire either for one-off or regular use. They are regularly used for concerts, exhibitions, conferences, training events, receptions and parties. 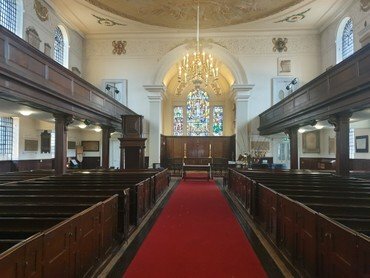 If you would like to enquire about availability please view our online calendar, then use our booking form or contact us at admin@stgeorge-themartyr.co.uk or 0207 357 7331. With 18th Century box-pews, large stained-glass windows and a seating gallery, the church space offers a unique venue for any concert or stage performance with capacity up to 288 people. In addition to the weekly lunchtime concerts, St George the Martyr has played host to choirs and stage performers from around the country.